St Mirren came from two goals down to steal victory against Motherwell and consign bottom-placed Hearts to relegation from the Premiership. A slow Buddies start meant Henri Anier and John Sutton were allowed easy finishes to give 'Well the lead. 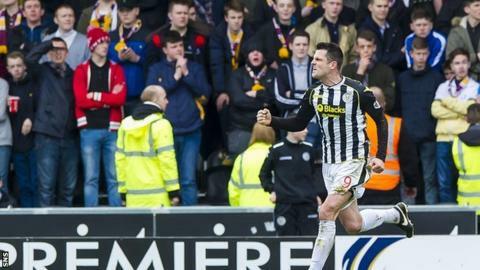 Steven Thompson's volley before the break gave St Mirren hope. But two goals in two minutes via Kenny McLean's penalty and Thompson's 16th goal of the season brought Saints a late win, moving them to 10th. St Mirren got off to the right sort of start. From McLean's corner Darren McGregor rose highest but his header was well saved by Motherwell 'keeper Gunnar Nielsen. Sutton's header just wide of the post was only the preamble as the visitors took the lead, and Saints played a part in their own downfall. An attempted offside trap failed miserably to deal with a Motherwell long ball which reached Lionel Ainsworth. St Mirren 'keeper Chris Dilo came out to meet the winger but it was the wrong option and Ainsworth calmly passed to Anier who had the simple task of firing into a fairly unguarded net. St Mirren should have equalised in the 25th minute from a corner but Jim Goodwin flashed his free header wide of the post. And almost immediately Motherwell made it 2-0. Stevie Hammell's cross found Ainsworth and his ball back into the box was met by a stooping header from Sutton. Soon after, he almost made it 3-0 but McGregor got a touch to the cross to send it wide. St Mirren were teetering and it was looking ominous for the Paisley side. But suddenly the home crowd were given hope. Motherwell failed to deal with a St Mirren corner and with the ball loose in the penalty box, there was Thompson to fire home to reduce the deficit at halftime. An injury to referee Euan Norris saw him replaced by fourth official Iain Brines for the second half. St Mirren came out with all guns blazing at the start of the second half. They pegged Motherwell back and a deflected shot from Jason Naismith went just wide. A near post header from Thompson was then well held by Nielsen. The St Mirren striker went even closer soon after. His curling shot again clawed away by the Faroese keeper. Motherwell responded with a double effort from Ainsworth. His first shot was comfortably saved, but his second effort from the edge of the box required a spectacular tip-over from Dilo. Substitute Craig Moore then sprung the Saints offside trap but dragged his shot wide as Motherwell looked to secure all three points. But with five minutes to play St Mirren won a penalty. A header from Thompson was judged to have struck the arm of Stephen McManus and up stepped McLean who calmly slotted home. And just after that St Mirren Park erupted. A loose ball in the box found the feet of Thompson and the big striker was at an acute angle but somehow his shot found the net, and the noise inside the stadium was deafening. Match ends, St Mirren 3, Motherwell 2. Second Half ends, St Mirren 3, Motherwell 2. Corner, St Mirren. Conceded by Craig Reid. Steven Thompson (St Mirren) wins a free kick on the right wing. Goal! St Mirren 3, Motherwell 2. Steven Thompson (St Mirren) left footed shot from the left side of the six yard box to the bottom right corner. Goal! St Mirren 2, Motherwell 2. Kenny McLean (St Mirren) converts the penalty with a left footed shot to the bottom right corner. Penalty conceded by Steven Hammell (Motherwell) with a hand ball in the penalty area. Foul by John McGinn (St Mirren). Substitution, Motherwell. Zaine Francis-Angol replaces Lionel Ainsworth. John McGinn (St Mirren) wins a free kick in the defensive half. Substitution, St Mirren. Gary Teale replaces James Goodwin. Attempt missed. Craig Moore (Motherwell) right footed shot from the centre of the box is close, but misses to the left. Gregg Wylde (St Mirren) wins a free kick on the left wing. Attempt missed. John Sutton (Motherwell) header from the centre of the box is close, but misses to the right. Foul by James Goodwin (St Mirren). James Goodwin (St Mirren) is shown the yellow card. Corner, St Mirren. Conceded by Fraser Kerr. Attempt missed. Craig Reid (Motherwell) left footed shot from the centre of the box is too high. Corner, Motherwell. Conceded by Chris Dilo. Attempt saved. Lionel Ainsworth (Motherwell) right footed shot from outside the box is saved in the top left corner. Attempt saved. Lionel Ainsworth (Motherwell) left footed shot from outside the box is saved in the top centre of the goal. Corner, St Mirren. Conceded by Gunnar Nielsen. Attempt saved. Steven Thompson (St Mirren) right footed shot from the centre of the box is saved in the top right corner.